The cap for Phase 4 of the EUETS, which runs from 2021 to 2030, needs to start at a level that matches the reality of emissions in 2020, rather than starting where the Phase 3 cap finishes. The surplus of allowances in the EUETS looks to set to get worse with the Commission’s current proposals for the Phase 4 cap, which covers the period 2021 to 2030. In 2015 emissions covered by the EU ETS were already below the level of the cap for 2020. Emissions are expected to continue falling through the remainder of this decade, driven mainly by increasing deployment of renewables and weak electricity demand. By 2020 emissions look likely to be over 10% below the cap at the end of Phase 3 (see chart). This will lead to additional surplus allowances generated from the start of Phase 4, continuing through all or most of Phase 4. This will in turn lead to the EUETS remaining weak even in the presence of the Market Stability Reserve (MSR). This problem arises in large part because the starting point for Phase 4 cap is out of date. It was effectively set in 2010 as part of the cap for Phase 3, because the EUETS Directive implicitly assumes that the Phase 4 cap will simply continue from where the Phase 3 cap finishes. However the Phase 3 cap was set before many subsequent trends were known, including the growth of renewables and the length and depth of the economic recession. Consequently it does not form a suitable starting point for Phase 4, and now looks far too loose. The Phase 4 cap needs to start at a level that reflects actual emissions (if this is, as expected, below currently proposed level, which would act as an upper bound in any case). Rebasing the cap in this way would lead to a much more effective EUETS that delivers effective signals for emissions reductions and investment. Without this sort of reform the EUETS risks being reduced to little more than an accounting tool, with a chronic surplus and individual Member States increasingly taking their own action to ensure the necessary investment. This increases the robustness of the mechanism and is more effective than changing the Linear Reduction Factor …. Rebasing to actual emissions increases robustness of the system by making it dependent on actual outcomes. 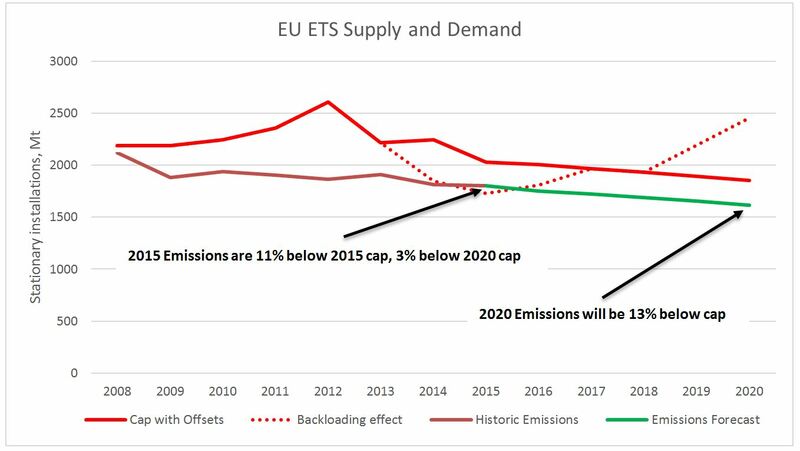 Aligning the cap with actual emissions also tightens the cap more quickly and more effectively than changes to the Linear Reduction Factor (LRF – the amount of annual emission reductions built into the EU ETS during the phase). This is shown in the chart below. The LRF would need to approximately double from the currently proposed value of 2.2%, to 4.2%, to have the about the same effect on cumulative number of allowances over Phase 4 as rebasing the cap, even in a high emissions case. And an even greater LRF would be needed to match the effect of rebasing if emissions by 2020 are low. Even then, changing the LRF reduces the level of the cap more slowly than changing the starting point of the cap. However increasing the LRF in addition to rebasing the cap helps ensure that surpluses are eroded and do not re-emerge through Phase 4, and so increasing the LRF remains a useful complement to rebasing the cap. This approach of adjusting caps to reflect the reality of actual emissions, where these diverge from earlier expectations, has been applied elsewhere. For example, in the Regional Greenhouse Gas Initiative (RGGI) in the USA, the cap was reduced from 165 million short tons in 2012-3 to 91 million short tons in 2014 to more closely reflect actual emissions. As a result, prices have moved away from the auction floor price, where they were had previously been stuck. Looking beyond carbon markets, incentive-based regulation of electricity, gas and water network charges in the UK in the 1990s imposed price caps typically lasting five years. In practice, costs fell more rapidly than was expected when the price cap was set, leading to high margins of price over cost. One-off cuts in the level of prices, referred to as P0 cuts, were implemented at the start of the next phase of the price control to realign the price cap with outturn costs, and thus capture the benefits of efficiency gains for consumers. The new starting point for Phase 4 would also be closer to that which was envisaged under the December 2008 European Council Conclusions in case an international agreement was reached and the EUETS would start from a reduction of 30% from 2005 levels by 2020. A 30% reduction from 1990 would, assuming the EU ETS cap to have been reduced in line with the reduction in other sectors, have led to a starting point for the Phase 4 EU ETS cap of approximately in line with emissions now expected. This was made conditional on action by other countries. Commitments to such action have now been made under the Paris Agreement. With the cap proposed by the Commission the EUETS seems likely to continue providing a largely ineffective signal for abatement well into the 2020s and possibly beyond. This would mean that by 2030 the EUETS will have been in existence for a quarter of a century, but will have provided an effective price signal for only a short period in the early part of Phase 2 (around 2009). A simple adjustment to bring the cap at the start of Phase 4 into line with the reality of emissions would go a long way towards solving this problem by reducing the Phase 4 cap, likely by around 2 billion tonnes or more over the 10 years of the phase. There are few easier and more natural adjustments to the scheme which could have such an impact. This entry was posted in carbon pricing, Climate change policy, emissions trading and tagged carbon pricing, climate change, climate change policy, decarbonisation, emissions trading, emissions trading scheme, EUETS on 20/06/2016 by adamwhitmore.